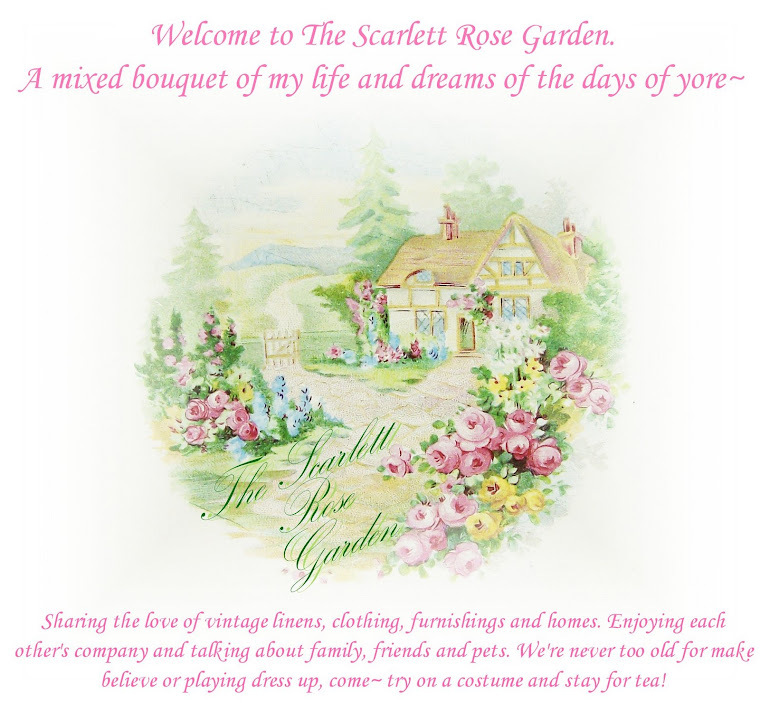 The Scarlett Rose Garden: House Tour Parade! Julia at Hooked on Houses is hosting a home tour party. Hop on over to her place to view more fabulous houses! I hope you like the song...yes, I know it's about Heaven but isn't it cute? 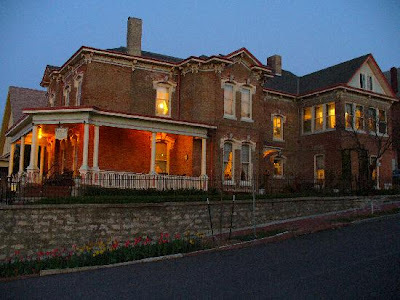 Today I'm featuring the Museum Hill Bed and Breakfast in St. Joseph, MO~ We stayed here for our anniversary a few years ago. I love Italianate homes. Huge brackets, stately arched pediments, brick...sigh.. If you want to see some FABULOUS homes and architecture, it's a wonderful city to visit. However, very bittersweet. So many *stunning* old homes are in need of major TLC. Many times you can pick them up for a song... I'm talkin' mansions people. Anyhoo... on to the pics! 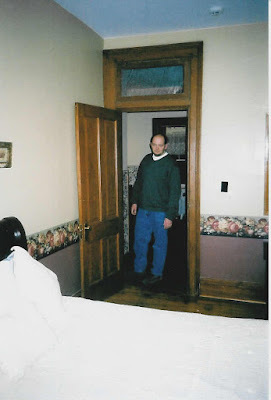 These are photos we took, but they are scans. 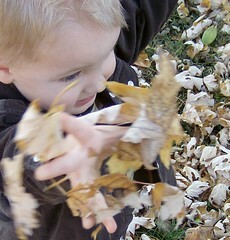 You can visit their site tho, and veiw a couple of great slideshows! 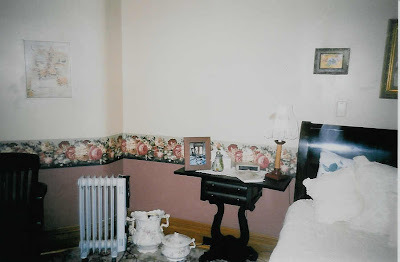 We stayed in the Empire Rose Room. 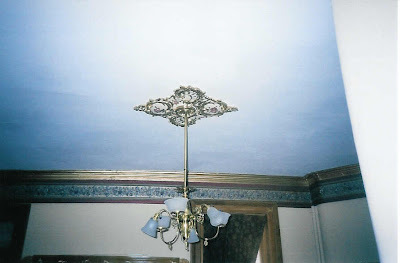 Original ornate plaster moldings and medalions grace the home~See those lucious curves!? 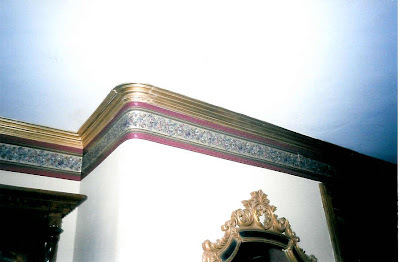 Curved plaster walls and crown molding, I was in house heaven. The home had been through a bad fire. The owners did an outstanding job restoring this old gal. See the remains of flames on the floor? I think it looks beautiful. 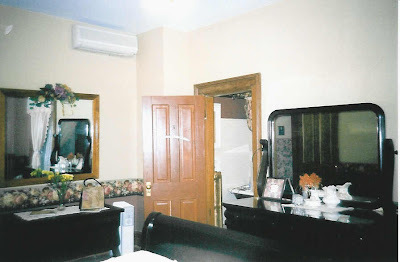 Here is our Empire Rose Room! More curved plaster walls...drooool. 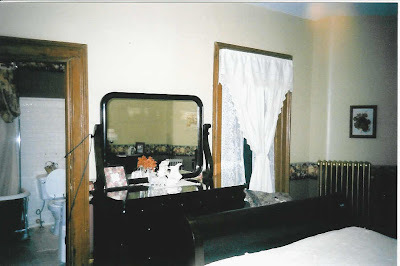 We got to sleep in this gorgeous sleigh bed with fluffy cream linens. The bathroom had a clawfoot tub and beautiful tile work. There was lovely Empire furniture throughout. One of the prettiest chamber pots I had ever seen. For display only, LOL! Nice transom window above our bedroom door. Ok, so the room and stay was great. Awesome breakfast, friendly hosts. 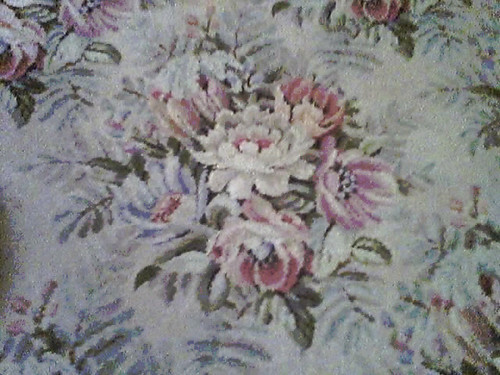 But what I REALLY wanted to roll up and stick in the car was that room sized vintage carpet!!! Didja see it? I couldn't keep my eyes off it... I'm surprised I didn't sleep on the floor that night, ha! These are lousy camera phone pics, I apologize! It's rolled up right now or I'd take some new pics! Here is a link to some homes currently for sale in St. Joseph. Definitely some awesome window shopping there!! And if you'll be in the area this fall, be sure to take one of these wonderful house tours! I think some start in September. I hope you've enjoyed the tour. I have many I could share but gee, I need to start keeping these posts on the short side! 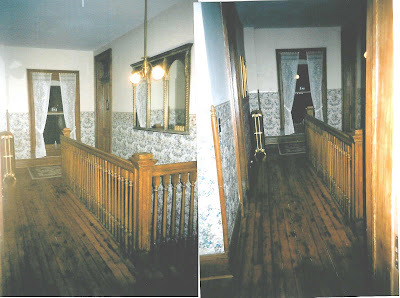 If you are interestind in seeing my 100 year old home, I started a tour a while back... I still haven't gotten through all the rooms yet. Click here if you'd like to take a peek. We've since painted the exterior. There is so much to do still! I'm off to view other houses!! Nikki I thoroughly enjoyed seeing this b&b. We haven't stayed in too many b&b's. One we stayed at in MO is the School House in Rocheport. Have you seen it? Interesting place, a former school house turned into a b&b. Thanks for joining Julia's tour! I love the image of you rolling up the rug and running out the door with it. Ha. I would love to visit that town and see the homes someday. Thanks for the tour, it was stunning! Truly a beauty no doubt! Thank you for such a lovely tour! thank you, Nikki, for stopping by! This B&B is just wonderful, even though it's more ornate than I usually like. That old architecture can't be beat. Thanks so much for the compliments on my bedroom. Your own house is just as beautiful as this place, Nikki! Would love it if you'd take us on a video tour of your house. That'd be fun! Wow. Out here in Los Angeles anything older than 10 minutes is considered "historic." It's wonderful to see houses like this that are truly full of history. Any idea what year the house was built? Thank you so much for this tour. Hi Nikki.... what a nice tour! Thank you for taking me along with you.... and for visiting my house in the roses, earlier this week... I'll be back again soon. This house looks like something out of an old movie. So much history there. We don't see many beautiful old houses where we are from (AZ). This is truly a gem. Very cool house! It sort of reminds me of the Governors mansion in Jeff City. Have you ever been there? My family and I used to go there for Christmas parties when I was little. 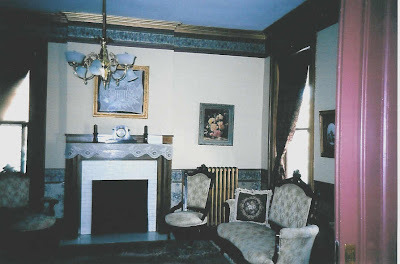 Great tour - love that you got tons of photos of the interior as well. Haven't been to Missouri but will have to plan a visit sometime! 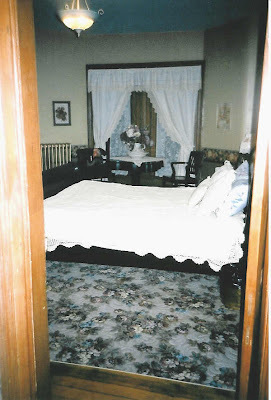 This is a very pretty bed and breakfast. What fun it must have been to stay there! 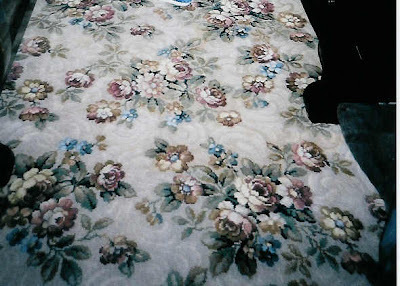 And I love those old carpets. Nothing like them today! For some reason that place reminds me of the Mary Poppins home. Or maybe I've just watched that too many times! What a beautiful place to stay! 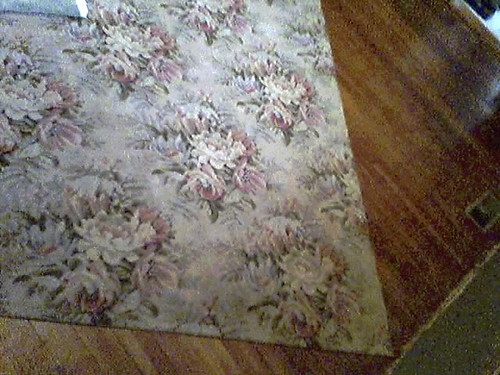 Most of the time those places are not decorated in period style, but it's wonderful that they did :) That's one beautiful rug you've got there! You know I wish I could save those homes. I wish more people felt like we did about them.